Headlines abound about the rise in deaths linked to heroin and opioid overdoses, yet the hopeful truth is this: addiction treatment works and recovery is achievable. 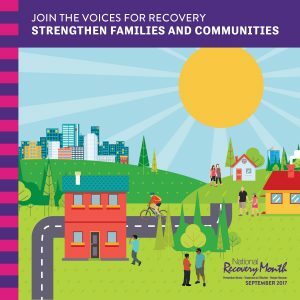 September is National Recovery Month, an observance focusing attention on behavioral health and the effectiveness of prevention and treatment. “Millions of people recover from addiction and mental illness when they have access to treatment and strong support services in their communities,” said Robert L. Parker, CEO of NewBridge Services. “We as a society must recognize that behavioral health is as important as physical health, and that prevention and treatment of addiction and mental illness can reduce the toll these disorders take on our communities,” Parker said. “Join the Voices for Recovery: Visible, Vocal, Valuable!” the theme of this year’s National Recovery Month, urges people in recovery and those who support them to be change agents in their communities. It also highlights value of peer support through education, mentoring, and outreach. “People can and do recover from addiction and mental illness, and the sooner intervention begins, the better the outcomes,” Parker said. For help, contact NewBridge at (973) 316-9333 or email services@newbridge.org.